I love being able to provide my family a home cooked meal that is easy to prepare, well-balanced and they all love. My home-style meat and potatoes is just that. It is also ideal to take to someone after having a baby or re-covering at home. One pan contains potatoes, hamburger patties and green beans. Begin by peeling the potatoes. Slice thinly into the bottom of an un-greased 9×13 baking dish. (I use my mandolin for this). The entire bottom should be covered. Sprinkle a generous amount of season salt over the potatoes. Next prepare the beef patties. Combine meat, eggs, bread crumbs, salt, pepper and onions. Shape into 4 patties and place on top of the potatoes. Arrange green beans around the meat patties, but not on top of them. Spray lightly with cooking spray. Cover with aluminium foil. Bake at 425 for 40-45 minutes until the meat is cooked and the potatoes are tender. TIPS: The number of potatoes needed depends upon their size. Try substituting 1 pound fresh green beans. Just wash, trim the tips and leave whole. 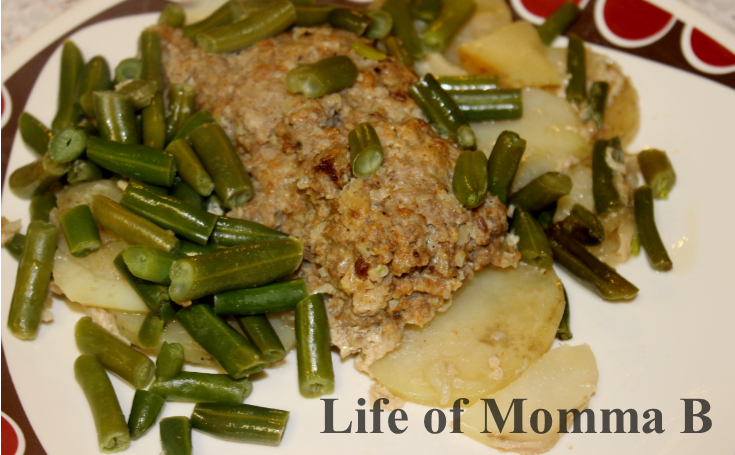 This entry was posted in Recipes and tagged beef, green beans, main course, one pot meal, potatoes. Bookmark the permalink.